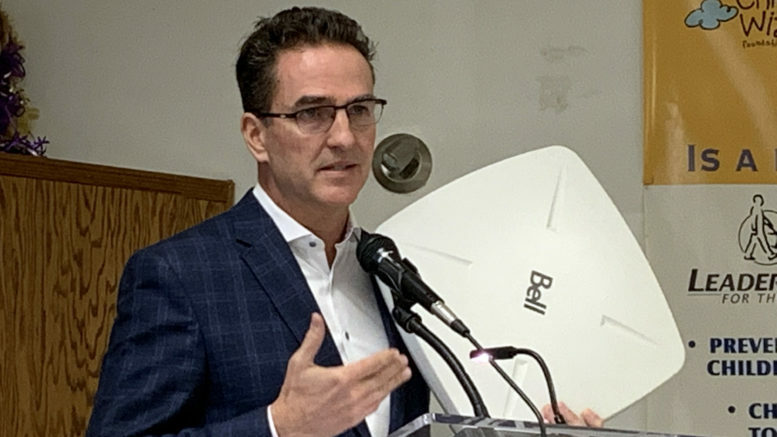 Bell Canada announced Friday it will leverage its public-private partnership with the Eastern Ontario Regional Network (EORN) to bring high-speed broadband access to 1.2 million homes in the region. Between 2010 and 2015, the telecommunications giant played a key role in putting in a backbone of 5,500 km of fibre cable in the ground across the region with the support of local municipalities, the province, and the federal government. Now, it’s building on that work. That morning, in Frankford, Bell’s vice-president of product development and management, Shawn Omstead, announced the company would be leveraging the fibre network and its existing cell towers to supply its new Wireless Home Internet service to residences and businesses at up to 25 megabits per second (Mbps). He explained the company is mounting new radio transmitters on its existing cellular towers that will connect with antennas that can be mounted directly on the outside of a house. While many areas are expected to have access by the end of the year, Omstead said the whole program roll-out could take five or six years to complete. The advantage of fibre, instead of microwave — a technology that relays a signal to towers not directly connected to fibre, Omstead says is that more capacity is available directly, so that in the face of more users, the provider doesn’t have to throttle its services — essentially slowing speed in the face of busy traffic during peak hours when more people are online or streaming. “When you have fibre, you can keep pushing more down the pipe as customers grow,” he said. Advancements in technology have also helped Bell roll out its service. Omstead said even in the last six months, the technology has improved to handle more simultaneous connections at one time. Already communities across Lennox and Addington, Hastings, Prince Edward, and Northumberland counties are coming online. Bell will be offering its service to homes and businesses, starting at $69.95 a month with a $99 installation fee. Omstead indicated that installations in areas with the service will be completed within one to two weeks. During his media conference, Omstead credited EORN’s vision to address the region’s connectivity needs. Hastings County Warden Rick Phillips has been on the EORN board of directors for several years as a member of the Eastern Ontario Warden’s Caucus. He credited Bell for furthering the organization’s vision to provide better access and higher speeds for all residents and businesses. 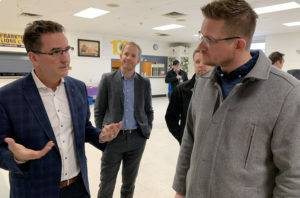 Phillips said improving communications infrastructure is a continuous effort on behalf of many partners at all levels of government as well as private-sector providers like Bell and competitor Xplornet, which partnered with the federal government for its own multi-million-dollar project in the area recently. Announcements like Bell’s aid economic development, he said. Phillips acknowledged there are still gaps in rural areas, both in wireless broadband service and in cellular service. He noted EORN continues to try to fill the gap by working together with government and business. In Prince Edward County, a tower near Bloomfield was one of the first across the region to be active. On Monday, another tower in Demorestville also went live, serving Picton and areas north. The County’s director of community development and strategic infrastructure welcomed the news. Picton’s The Source outlet is an authorized seller and can help customers learn if they’re currently in the 10-km radius necessary to receive the signal. Mapping details are also available at www.bell.ca/fastinternet.